Wong Wai King is the author of Tai O – Love Stories of the Fishing Village. 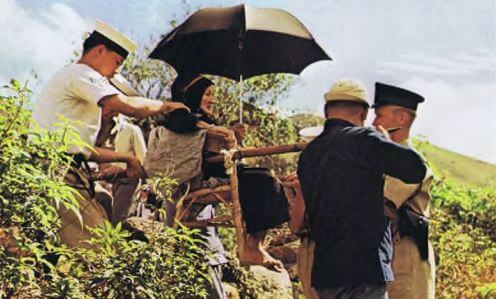 Among many subjects that Ms Wong has written about in her book is a short article titled “Toi shan dau” (Sedan-chairs). Ms Wong has very kindly agreed to allow the re-typing of this section to be included as an article on our site. Copyright remains exclusively with the author. Please note the images that accompany this article do not come from Wong Wai King’s article. See Related Inddhk articles below. Wong Wai King: A shan dau was actually a rattan seat. Each side of these seats had three rattan circles, and a bamboo pole linked the circles on each side, creating a seat for passengers. It was mainly used for travelling over the hills (shan) when roads had not yet been paved and vehicles were rare. A shan dau was carried by two people, usually women, one in front and one behind. About 30 to 40 people took part in this business, only a handful of them men. They carried not only the passengers but also their paraphernalia for worshipping in the temples. Sometimes they helped to carry food for the monasteries. It was a tough job, especially considering that the workers did not wear any shoes. Some of them wore the pei tak which was a piece of leather tapering at the open toe, looking something like our sandals nowadays. Target customers were Shanghainese, nightclub women, government officials and any rich people in general. Customers sent mail or people to arrange with the monasteries for the service. They would travel to Tai O by ferry, then take a sampan to the hand-pulled ferry pier (now the site of Tai O Chung footbridge) where the shan dau workers waited for passengers there instead. Most of the customers were heading to the Po Lin Monastery. Some went to Man Cheng Po or other monasteries. For those customers who took private sampans to go to Tung Chung, shan dau workers had to hike to Tung Chung in order to pick them up. Night-time travelling was also a possibility, with a torch hanging in front of the shan dau…though this tough work only earned the carriers eight to nine dollars in the 50’s. In the past a shan dau would have been called to carry the sick to the Shek Tsai Po clinic for medical consultation. 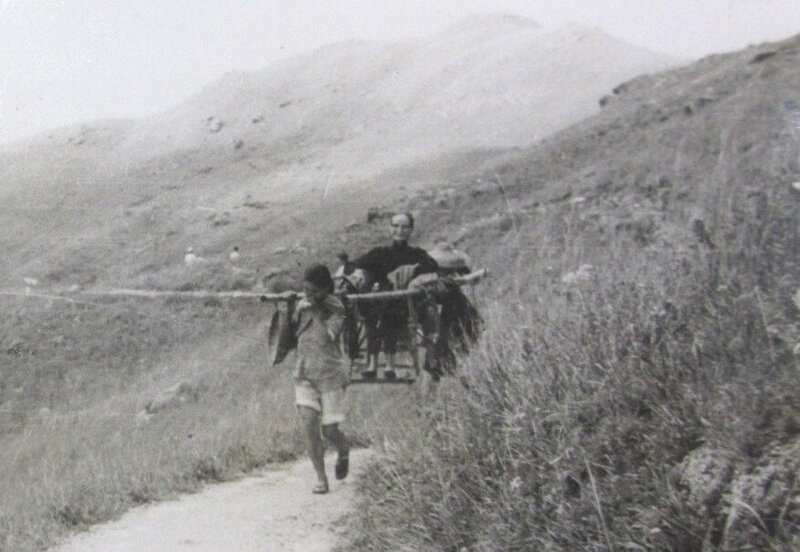 Monks on top of the mountains relied on this primitive means of transport to go down to the village if they fell ill. The transportation fee ranged from $10 to $20 depending on the length of the journey. Some of the passengers would give tips. A common route for shan dau was from Tai O via Keung Shan, Ling Yan Monastery and Luk Wu to Po Lin Monastery, Some customers wished to go to Chi Hing Monastery in Man Cheung Po. According to the shan dau workers, former Governor Sir Graham [sic Sir Alexander Grantham?] and Lady Graham and Mr Ho Tung’s family, had taken shan dau to get to Po Lin Monastery. Many university professors and doctors also took this service. After the Tai O Road was finally opened on 29 March, 1971, vehicles could drive from Mui Wo all the way to Tai O, making the practice of toi shan dau a memory of the past. This article was first posted on 27th April 2017.